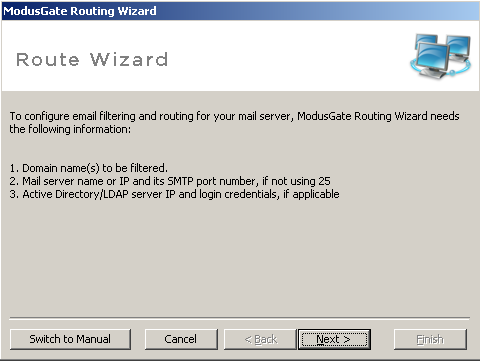 This article describes how to configure modusGate with your mail server. NOTE: You must create a route for each domain for which modusGate is to filter email. 1. Launch the modusGate console. The Console will be launched and you will be prompted with the Routing Wizard. 2. Select the "Next" button and enter your Mail Domain Name, e.g. xyz.com. Email sent to this address will be filtered by modusGate. 3. Select the appropriate Mail server type from the dropdown list. If your server type is not listed, select one of the following: SMTP, SMTP_VRFY. The SMTP option cannot validate mail recipients, therefore invalid addresses will be created in the user list and count against your user license. In addition, if alias email addresses are used, they will be added to the user list and total user count. SMTP_VRFY is supported by most mail servers, but must only be used if the mail server is protected by a firewall with no direct public access. Without a firewall, the list of valid user accounts can be easily obtained over the Internet. Alias email addresses are supported by SMTP_VRFY; they will not be counted against the user license. 4. Enter the Mail server name or IP. 5. The SMTP Port number automatically displays 25; change this only if you use a different port number. 6. If you had selected Exchange as a mail server type, click "Next" and enter your Active Directory/LDAP server information. Note: The Exchange option authenticates with your LDAP/AD server. In order for the VM on Azure to have access you must create an inbound firewall rule to allow the public IP address of your VM to access port 389/3268 (LDAP). How to setup a Static IP in Azure. 7. Enter the Server name or IP address for your Active Directory or LDAP servers. If using Exchange 2007-2016, port 3268 is automatically configured for the Global Catalog: this provides access to the entire list of users’ mailboxes. Selecting Use TLS will auto-reset the port to 3269. You may optionally enter a custom port. 9. Enter the AD root domain name. This is the root or internal domain name configured on your Active Directory/LDAP server, e.g. domain.local. 10. User DN and Password: enter the email address and password of the Administrator. Note: Optionally you can create a mgate user in AD that has only read access. The email address format is supported by both Active Directory and LDAP. 11. Enter a valid email address in the Enter Email to Test field and click Test Route. The system will attempt to connect to your mail server and send a message to your address. You will receive feedback if there are any errors. Check your Inbox to confirm the message was received. 12. Click Next to view the summary table. Click Add to enter other domains or mail servers, if necessary. To edit or change any information, use the Console's Connection settings. Next Step: Test your mail flow.